Philadelphia « CONSTABLE RESEARCH B.V.
One of the most influential inventors of our time was Nikola Tesla (1856-1943). He was specialized in “Electro-Magnetic Inventions“. Tesla became a myth. He became a myth because he was not a “normal” inventor. Tesla saw his inventions in his mind. He not only saw them he could even play with them in his mind to improve the design. Tesla invented normal inventions but when the normal inventions were created he started to create abnormal and even absurd inventions. He became the prototype of the “mad scientist“. His main objective was to give mankind the opportunity to become God, The Creator. This a part of a letter to the New York Times that Tesla wrote in 1908. If you read this Letter carefully you will see that Tesla has discovered the Source of Creation, The AEther. I want to focus this blog on one highly mythical story in the Life of Tesla. In this Story another “mad scientist” named John von Neumann appears. The story reads like a science fiction book but many parts of the story are factual and even the facts are disturbing enough. At a certain moment Tesla claimed a few things. He claimed he could create the “Weapon of all Weapons“. This Weapon would end All Wars. Tesla also claimed he could talk with extra terrestrials by an invention called the Teslascope. Later he claimed he could create Invisibility. Tesla claimed much more. When he was eighty-one, Tesla claimed he had completed a dynamic theory of gravity with this theory he could create anti-gravity. The claims of Tesla about New Weapons, Invisibility, Anti-Gravity and even Time Travel attracted the US Army. The first goal was to create an invisible ship. In the experiment he would be collaborating with John von Neumann. John von Neumann was a mathematical genius. Just like Tesla he was not a “social person”. 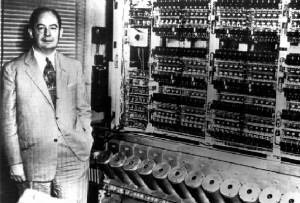 Von Neumann was the man behind the first computer (the Enniac), the Atomic Bomb and the H-Bomb. He was also highly infuencial in the field of Quantum Mechanics. John von Neumann believed he could calculate everything. He believed that he could create an Artificial Mind. When he could connect this Artificial Mind to The Force of Creation he could create completely new things. He knew Tesla could help him to reach his goal. In 1940 a full test was done in the Brooklyn Naval Yard. It was a small test, with no one on board the vehicle. By 1941 a ship was procured to do a full experiment. Tesla knew that the mental state and bodies of the crew would be affected severely. He wanted more time to perfect the experiment. Von Neumann disagreed and the experiment was performed with a crew on board. Tesla left the project. The result of all this became a legend called the Philadelphia Experiment. Tesla was right. He was right because Tesla always used his own body and mind in his own experiments. The physiological effects on the crew were profound. Almost all of the crew were violently ill. They experienced tremors and other distortions of the neurological system. Some suffered from mental illness as a result of their experience; behavior consistent with Psychosis is described in other accounts. Still other members were physically unaccounted for. They simply vanished and came back later in time. Five of the crew were allegedly fused to the metal bulkhead or deck of the ship. Still others were said to fade in and out of sight. All of the crew-members experienced Time-Travel. Later the project was transferred to Montauk. John Von Neumann became the manager. In the Montauk Project he wanted to create a Mind Amplifier. The Legend tells us that he was able to do this. What von Neumann did not realize was that the Amplifier created a Hole in Time (a Portal, a Wormhole) and this portal was a Two-Way-Street. Others, Extra Terrestials, used the Hole to enter our Universe. The story of Montauk reads like a science-fiction story and it inspired many Books and Movies. Later the projects changed names (Phoenix, MKULTRA). 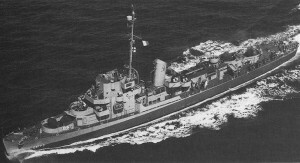 Everything connected to the Philadelphia Experiment, the Montauk Experiment and other Strange and Dangerous experiments is denied by the American Government. The American Government was at that time controlled by Congress and Congress organized hearings. One of the most intensive research programs was performed by the Church Committee. It proved that the Army and the Intelligence Services violated many laws. Many people don’t trust the Army. If you search the Internet it contains thousands of websites that contain facts and interpretations of the facts. Almost nobody believes the Government is telling the Truth. This is a very BAD SIGN. It decreases the believe in Government and its Actions to serve the Citizens. People don’t trust the Army and the Government because every time when its actions are researched by Parliament many illegal activities are proved. They have aquired the expectation that the Government is always hiding something. Because they don’t know the “real” facts they create their own theories (Myths). Many of these Myths are about Conspiracies. Somewhere behind the Government is an Evil Force trying to Control Everybody. If you look at the major priorities at this moment (Mind Control) it is very difficult not to believe in a Conspiracy to Control Everybody. The Army has developed neural implants to control the behavior of humans. The implants give direct input into the brain and make it possible for a Central Command Center to manage the behavior of soldiers. They are also used to control the behavior of animals (Sharks). The Army has invented a Long Range Acoustical Device (LRAD) that can be used to control a crowd. It is able to induce high levels of pain. Another technology is called Trancranial Magnetic Stimulation (TMS). TMS uses Electro-Magnetic Fields to control the emotions. These projects are all described in “US Electromagnetic Weapons and Human Rights” By Peter Phillips, Lew Brown and Bridget Thornton. Do you want to read more about the Ethics of Mind Control? Do you want to read more about the Legal Implications of Mind Control?